Two hundred Igigi astronauts occupied the Landing Platform in Lebanon, then flew to Eridu. They mixed with Earthlings and Nibiran Expedition people and watched Marduk and Sarpanit wed. 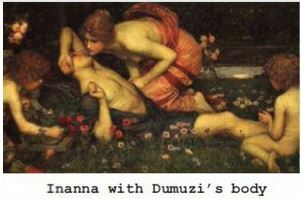 In some versions of the tale, Inanna and Dumuzi became lovers. Enkiite and Enlilite elders hoped that if Dumuzi wed Inanna, deadly rivalry between their lineages would stop. “‘Perchance the espousing peace between the linages truly will bring,’” Enlil to them all did say.” He ordered the Indus Valley developed as a dowry for Inanna and Dumuzi [Enki: 251; Giants: 215]. Dumuzi had gone with Ningishzidda and their hybrid half-brother, Adapa, to Nibiru. When Dumuzi returned to Earth from Nibiru, with Adapa, he brought sheep and goats. Enki made Dumuzi boss of Africa’s domestic herds and herdsmen. Jealous that Dumuzi had replaced him as father Enki’s favorite, Marduk made sure Dumuzi and Inanna didn’t, in Sitchin’s version of the tale, wed. 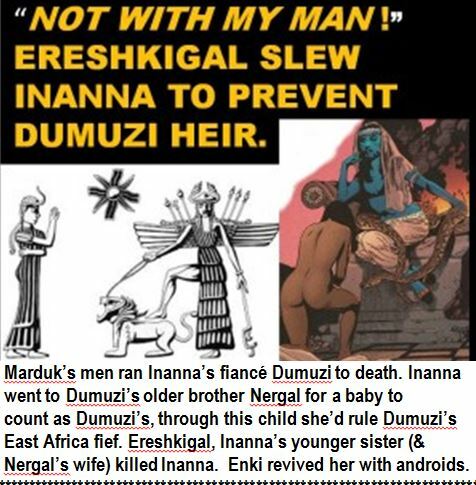 In Hardy’s version of the Inanna-Dumuzi tale, they do wed. “Inanna and Dumuzi marry and live together happily a long time, and yet they can’t have any kids—thus no heir.” [DNA: 43]. Dumuzi, aghast, fled to hide behind a waterfall but slipped into the rapids and drowned in Lake Victoria[Enki: 253]. Inanna flew to sister Ereshkigal’s weather station at Cape Arulas, where Gibil left Dumuzi’s body. Ereshkigal knew Inanna came to exercise levirate to beget an heir with Nergal. For levirate, a brother of the man who died (Nergal, Dumuzi’s brother in this case) impregnates his dead brother’s wife. The child they begat succeeds the dead brother. 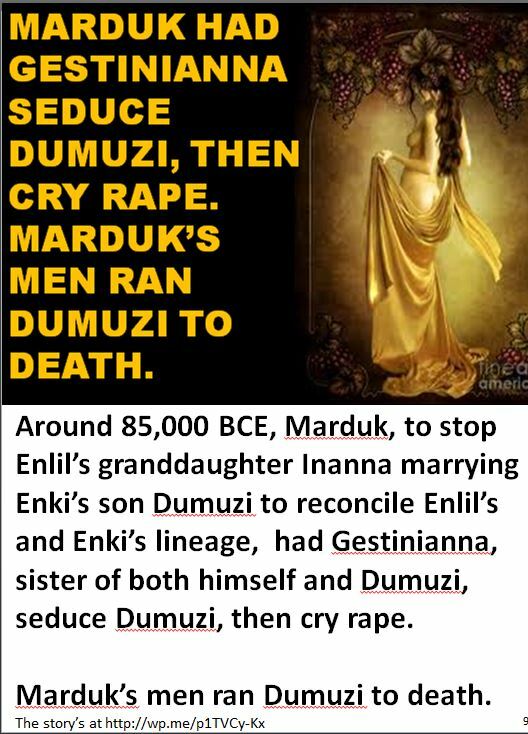 Inanna ruled Dumuzi’s eldest brother, Marduk, unfit to impregnate her since Marduk (Dumuzi’s firstborn brother) caused Dumuzi’s death. 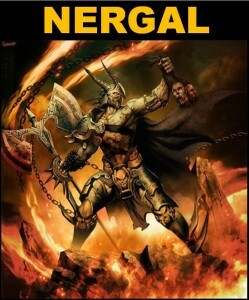 So she sought Dumuzi’s next oldest brother, Nergal, Ereshkigal’s mate. Inanna forced her way in, but Ereshkigal disarmed her and hung her on a stake to die. “Upon the corpse the clay emissaries a Pulsar and an Emitter directed, then the Water of Life on her they sprinkled, in her mouth, the Plant of Life they placed. Then the dead Inanna arose” [Enki: 255]. Inanna took Dumuzi’s body to Sumer and mummified him so he could rejoin her bodily on Nibiru, since, she said, Nibiran gods live forever [Cosmic Code: 90, 96].